In a 1961 article published by the London newspaper The Observer, British lawyer Peter Benenson launched an “Appeal for Amnesty” for political prisoners and went on to create Amnesty International (AI). Still headquartered in London, AI now operates over 70 country-specific branches and is perhaps the world’s best known human rights organization. The creation of Amnesty International (AI) was firmly rooted in the geopolitics of the Cold War and decolonization. The traditional account of AI’s founding goes something like this: Amnesty International was founded by British lawyer Peter Benenson after he read a newspaper article in 1960 about two students in authoritarian Portugal who had been imprisoned for making a toast to freedom while drinking in a local bar. The realization that, like the two Portuguese students, thousands of prisoners on both sides of the Cold War divide had been jailed simply because they stood up for their political principles spurred Benenson into action. The official story reaches its climax on May 28, 1961, when Benenson published his “Appeal for Amnesty.” The article, entitled “The Forgotten Prisoners,” called on activists from around the world to organize in order to pressure repressive governments to release “all political prisoners everywhere.” Jailed for their beliefs, Benenson labeled these detainees “prisoners of conscience.” In July 1961, Benenson and several colleagues, such as Quaker peace activist Eric Baker, British lawyer Leon Blom-Cooper, and prominent Irish statesman Seán MacBride, formally established AI. 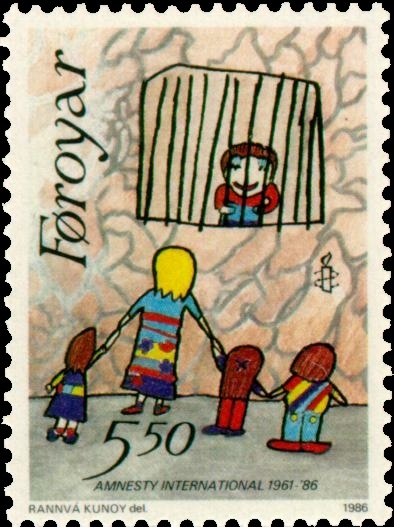 Faroe stamp celebrating Amnesty's 25th anniversary, painting by Rannvá Kunoy (1986). Public domain via Wikimedia Commons. This official narrative, however, is incomplete. Amnesty’s activism on behalf of political detainees was by no means a preordained certainty. Indeed, the organization itself may never have existed without Benenson’s fortuitous involvement in a crisis of decolonization — the 1955-1959 anticolonial rebellion on British-ruled Cyprus. Benenson first visited Cyprus in 1956 as a war correspondent for The Spectator. Being a barrister, he wandered into the law courts to speak with Greek Cypriot lawyers. They told him that prisoners were routinely tortured and beaten at the hands of their interrogators. Benenson decided to help by lobbying on the Cypriot lawyers’ behalf so that they could interview imprisoned clients. He then gathered a group of lawyers from all major British political parties to form “Justice” — the British chapter of the International Commission of Jurists (ICJ). Originally formed by a group of West German lawyers, the ICJ was a decidedly anti-communist organization dedicated to exposing human rights abuses carried out in communist states. Benenson’s “Justice” organization exhibited anti-communist sentiments, too, but it also critiqued British colonial policies. In addition, “Justice” sent observers to attend the apartheid South African government’s notorious “Treason Trial” and trials of political dissidents in Hungary. The brutality Benenson encountered in both communist and colonial domains made him reflect deeply on the world around him and his place in it. He experienced a profound spiritual transformation and, in 1958, converted to Catholicism. Benenson’s Cyprus activism and religious awakening also led to his friendship with future Amnesty co-founder Eric Baker. A committed Quaker, Baker traveled to Cyprus as a peace activist and journalist, whereupon Baker and Benenson struck up a close friendship. Their friendship, shared vision, and continued correspondence would soon lead to the founding of Amnesty. As Eric’s wife Joyce later remembered it, “Peter was the inspiration, Eric was the engineer” behind Amnesty’s creation. In 1960, Benenson authored the foreword to the anonymously written book Gangrene — a collection of prisoner testimonies containing allegations so damning that the French government soon banned the book. Gangrene was ostensibly a book about torture committed by French and British forces in Algeria and Kenya during the 1950s, but Benenson’s foreword also addressed the abuses he witnessed in Cyprus. His discussion of torture allegations against British troops and the obstacles that police and prison authorities placed in the way of lawyers seeking to defend their clients suggests that Benenson’s experiences in Cyprus profoundly affected his opinions on the ubiquity of government repression on both sides of the Iron Curtain as well as how best to promote human rights in the future — ideas that found expression in his 1961 Appeal for Amnesty. Benenson’s original Observer article was republished worldwide, with immediately tangible results. Within several weeks, volunteer groups had been established in several European countries. These various national branches began to raise awareness for the plight of selected individual political prisoners as a means of highlighting the broad phenomenon of political detention. In this way, AI believed that it could act on behalf of all political prisoners by advocating the cases of select individuals. Yet, it differentiated between Prisoners of Conscience (who did not practice or advocate the use of violence) and campaigned for their release, and those prisoners who did not meet these criteria for whom it campaigned only to improve their conditions of detention. Due to its subsequent “Campaign Against Torture,” launched in December 1972, and its continued advocacy on behalf of prisoners, AI received the 1977 Nobel Peace Prize. Today, Amnesty International is one of the largest and most prominent human rights NGOs in the world. In creating AI, Benenson drew inspiration from Christian notions of charity and compassion as well as the anti-slavery movement—two central elements of nineteenth century humanitarianism. He wrote that 1961 was an auspicious year because it marked “the centenary of two great events in the history of human freedom”—the American Civil War, which led to the end of slavery in the United States, and the emancipation of Russian serfs. The Cold War also influenced Amnesty. The 1956 Soviet crackdown in Hungary and the Czech government’s persecution of the Archbishop of Prague particularly outraged Benenson. As an organization motivated by Christian principles, Amnesty remained decidedly anticommunist. Even so, it sought to bridge global divisions by sponsoring prisoners in sets of three—one each from the Eastern Bloc, the West, and the “Third World.” Finally, by insisting on every prisoner’s right to a fair trial and humane treatment, Amnesty’s activism linked notions of civil rights derived from citizenship in the state and universal human rights inherent in all individuals. Activism based on such universal claims grew rapidly in the decades after Amnesty’s establishment. Amnesty International has a well-documented archival collection that includes many administrative documents such as conference reports, minutes from meetings, and correspondence between AI activists. The archive also houses an oral history collection of interviews with many of the individuals involved in AI’s early years. In terms of secondary sources, Buchanan’s article is a scholarly assessment of the history of AI’s founding derived from archival work. Hopgood, Neier, and Power rely more on interviews with current and former employees to analyze AI’s development as an organization and its major contributions to the international human rights movement. Amnesty International Archives, International Institute for Social History (Amsterdam). Anonymous. Gangrene (London: Calder Books, 1959). Eric Baker Papers (Bradford, UK: University of Bradford). Buchanan, Tom. ‘“The Truth Will Set You Free”: The Making of Amnesty International’. Journal of Contemporary History 37, no. 4 (2002): pp. 575-597. Hopgood, Stephen Hopgood, Keepers of the Flame: Understanding Amnesty International (Ithaka: Cornell University Press, 2013). Neier, Aryeh. The International Human Rights Movement: A History (Princeton: Princeton University Press, 2012). Power, Jonathan Power. Like Water on Stone: The Story of Amnesty International (Boston: Northeastern University Press, 2001). Brian Drohan teaches European history at the U.S. Military Academy – West Point. His research explores the roles of humanitarianism and human rights in war, particularly during the end of the British Empire. Brian was a participant in the Global Humanitarianism Research Academy (GHRA) 2015. Citation: Brian Drohan. ‘London, 1961: The Foundation of Amnesty International’, in Online Atlas on the History of Humanitarianism and Human Rights, edited by Fabian Klose, Marc Palen, Johannes Paulmann, and Andrew Thompson, 2015-12, urn:nbn:de:0159-2016090584 [2019-04-26].